1. Why do you want to become a RA? 2. Why do you think you can be a good resident assistant? 3. How do you imagine your typical week, from the position of a resident assistant? 4. What is the most difficult aspect of working as RA, from your point of view? Most students apply becasue they want to get free meals, accommodation and stipend. Or they like the RA role because it offers an easy way of blending into the community, and getting to know the other students. But you should rather say that you want the position to give something back to the community, that you feel like representing the students, and helping them. You can also say that you try to learn the basic working habits while studying, and that the RA position is perfect for building a sense for responsibility–something you will benefit from later, as an employee. Tell them that you have a good understanding for the ins and outs of life at the dormitory. You can also say that you believe to have the right personality for the position, and good communication skills, and an ability to work independently. Try to show them that you plan to actively help with social, academic, and personal adjustment of students to the residence hall and University. The key is to simply show that you won’t just wait for a phone call, or a knock on the door of your room. Say that you will participate in the weekly staff meetings, ask students for feedback and ideas for improvement, design decorations, help with organizing events, be always available on the phone, etc. The job is not always easy. Sometimes you will answer phone calls late in the night, or you will have to report a friend who had a party in the room (well, at least you will have an obligation to report them, and whether you will follow it or not is your choice). In your answer, you should show the hiring committee that you understand the complexity of the position, and that you know it won’t be always easy. Tell them that you are ready for all aspects of the job and won’t let your emotions to interfere with the decisions you will make from the position of a resident assistant. What can you improve about this building? The more people apply, the more complex the interviews will be. Alternatively you can continue your interview preparation with one of the following articles. Physical, mental, practical preparation – Interesting insight on the interview preparation. Do everything right and improve your chances of succeeding at the end. 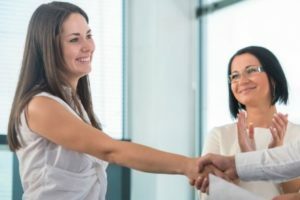 What to bring to the interview with you – Learn what documents to take to the interview with you, and how to present them to the interviewers.